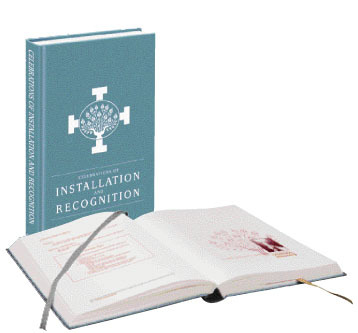 A handsomely bound, user-friendly, 372-page book, Celebrations of Installation and Recognition is a unique and comprehensive resource and commissioning tool for bishops, pastors, parish administrators and coordinators of the various diocesan and parish ministries. Written in response to a need frequently expressed in parishes and dioceses across Canada, it provides celebrations for installing a pastor or a parish administrator, and for recognizing all those who serve in the various ministries of the Christian community. These celebrations of installation and recognition may be celebrated by the parish community within the Mass, or in the context of a Liturgy of the Word or the Liturgy of the Hours. to recognize a deacon or pastoral assistant. recipients of honours and awards. meditative prayers corresponding to each aspect of ministry. The book also provides brief background and pastoral notes for each form of ministry. These introductory texts preceding each celebration offer an historical synopsis of the ministry as well as formation requirements for potential ministers. They will be especially helpful to local pastors seeking material for homiletic meditation and to parish councils seeking guidelines for commissioning and forming ministers. The meditative prayers in the appendix will benefit those new to ministry, as well as offer restorative inspiration to experienced ministers. The pastor could also give them to individuals and groups as part of their ongoing formation. The celebrations themselves will help recognize, accept, commission and support all who serve the community. By assembling these celebrations, prayers, and pastoral notes in a single volume, this book makes them conveniently accessible to pastors and to those responsible for the commissioning and formation of lay ministers. The installation of the pastor of a Church provides the entire parish community the opportunity to express support and solidarity. In this celebration, the integral links among the parish, the pastor and the bishop are named and celebrated. As the pastor is entrusted with the care of the community, the parish grows in its appreciation for the role of the pastor, and the responsibility the whole community shares in carrying out its Christian vocation. In celebrating recognition of other ministries, specific individuals and groups are mandated to provide a range of services to their community. Honouring the work of associates by these celebrations of recognition introduces them to the community and invites that same community to pray and support their ministry. The celebrations of recognition thus serve to strengthen the community and, at the same time, encourage others to offer their own gifts for service. These celebrations are easily adaptable to the specific needs of the community. For example, three forms of the celebration of installation of a pastor are provided to accommodate the circumstances of the parish. The celebrations of recognition provide a model that may be adapted to recognize various ministries and services within the Christian community. For example, other prayers may be selected, other questions chosen to describe a specific ministry, or the symbols of ministry may be varied. The celebrations of recognition might also be adapted for ecumenical use, especially in the case of ministries carried out by individuals of various Christian churches, such as pastoral work in prisons, palliative care, ministry to the sick and pastoral work in universities and colleges. Although these texts have been developed as possible celebrations within the context of the Mass, they may also be used within a Liturgy of the Word or the Liturgy of the Hours. an elegant and sturdily bound cover, illustrated section pages, and ribbon markers. 372 pages, 19 x 26.5 cm, foil-stamped cover and spine, ribbon markers, two-colour text.